You will be very welcome at any of our services over Christmas. Explore the meaning of Christmas through carols, drama and activities suitable for all ages. A service especially for families. 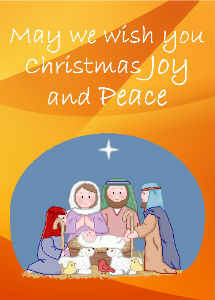 Children are invited to come dressed up as any of the following: shepherds, sheep, angels, Mary, Joseph etc. (sheep will be especially welcome this year) for the nativity part of the service. Refreshments will be served afterwards. If you are looking for a church which has a midnight communion service on Christmas Eve, St John the Evangelist, Carter Street, Sandown has such a service starting at 11.15pm. The vicar will lead the service at which children are welcome to come and show us what they have had for Christmas!